The focus of theresearch group in the last three years lay on horizontalEuropeanisation processes in academic, bureaucratic, professionaland associational fields, as well as on related conflictsand bargaining relations and their impact onpatterns of social inequality. Complementary to theEuropeanisationof social fields, the Europeanisationof social space(P. Bourdieu) was analysed,taking the examples of thetransnationalisationofeveryday practices, collective memoriesandreferencegroups of socialinequalities. This raises thequestionof the relationship betweenfield-specific and space-specificEuropeanisationprocesses. Another theoreticalchallengewasto distinguish differentmodesof Europeanization(power/coercion, competition, communication and cooperation) which lead to transnational norms and imitation, learning and socialisationprocessesin the academic world, asylum administration, everyday life, professional behaviour, industrial relations and the perception of social inequalities. Given theprofoundcrisis of Europeanintegrationin the wakeof theEurocrisis, the second phase will emphasisetheanalysis of conflictsandtensionsbetweennationaland Europeanregulations, identifications, and patterns of integration and social inequality. First, Europeanization processes are characterized by tensions associated with the unequal distribution of social resources and opportunities. Especially in the social and academic inequalities a deepening of the center-periphery-pattern in Europe and an increase in social inequalities between different groups of people can be observed. This is called double dualization. Second, Europeanization processes are characterized by conflictual regulatory and standardization processes in a political-administrative multi-level system. This is documented in the politicization of horizontal Europeanization processes. Third, Europeanization processes are characterized by conflicting interpretation and identification pattern. This goes along with the erosion of trust in the EU and in general with the shaking of certainties in everyday life. Fourth, in the euro crisis is about the area of conflicts of national and transnational solidarities that are currently being renegotiated under the European euro and debt crisis. 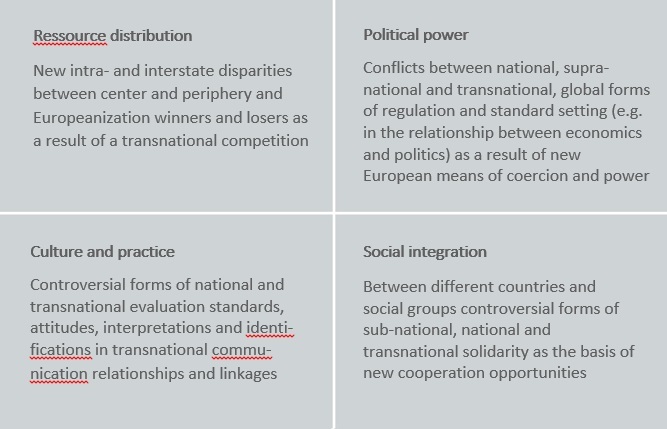 With these four concepts (double dualization, politicization, shaking of certainties, controversial solidarities) the challenges of the current and crisis-ridden Europeanization processes should brought to the term and a contribution to a differentiated explanatory framework for the dynamics of social conflicts in the processes of Europeanization should be made. Overall, an independent contribution to the theoretical development and institutionalization of sociological research on Europe should therefore be provided in the research group. For this purpose, the various progressive forms and modes of horizontal Europeanization and the crisis and conflict dimension of horizontal Europeanization processes will be examined. A brief summary of previous results and the next steps of the seven sub-projects can be found in the Mid-term brochure (in German language).